Just because is a selection of generally one off pieces, often inspired by a stone I have. It currently also includes other pieces that don't fit anywhere else! Made from the other half of a silver pebble I made to create a boat pendant. The band is 2mm by 4mm, with the half pebble soldered into it. An aquamarine is set inside the boat, with the inside of the boat gold plated. This is a total one off, with a beautiful aquamarine. I am very tempted to keep it! 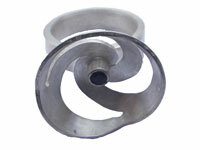 The first spiral type ring I made, with the spiral dome soldered onto the ring, and the tube soldered inside. The tourmaline was then set. It is a deep red tourmaline. 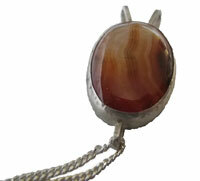 A simple agate pendant (although it may be a carnelian). One off. Comes with silver chain. The pendant pictured here is my second attempt at a boat pendant, and it is more of a moon boat. 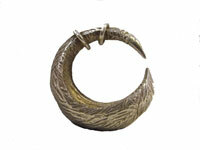 It is made with a lost wax process, where I carved a wax piece which I then had cast. It is a one off and not for sale. However, I am looking at making more, similar pieces. None will be exactly the same as I will make each wax and have it cast without getting a mould made. Below are pictures of the current waxes I am making. Let me know if you are interested in any. When I cast any I will put the photos up here.